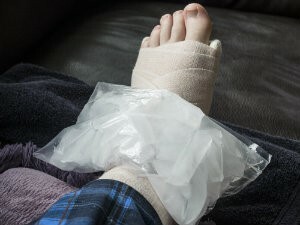 What do I do about a swollen ankle after surgery? | Podiatry Associates, P.C. What do I do about a swollen ankle after surgery? Developing a swollen ankle or a swollen foot after surgery is normal, but can be concerning. Excessive edema is uncomfortable and contributes to a variety of complications, including an incision breakdown or an inefficient or incomplete healing in the tissues. To prevent this, you’ll need to minimize any swelling or bruising in your lower limbs by taking care of your feet right after surgery. There are several ways to minimize swelling and bruising. Some of the most effects methods make up RICE therapy: rest, ice, compress, and elevate. Rest your foot or ankle from all activities and ice it regularly to reduce inflammation. If it’s safe to do so, wrap it in a compression bandage to keep fluid from pooling in your soft tissues. Elevate your limb on pillows above the level of your heart to keep gravity from pulling fluid into your soft tissues, too. Our staff might recommend anti-inflammatory medications as well to reduce your discomfort and swelling. Let us help you through every stage of your surgery, including your recover. Call Podiatry Associates, P.C. in Castle Pines and Parker, CO, for an appointment at (303) 805-5156. You can also use our website.